Christmas is coming and with it the wonderful opportunity to give a loved one the perfect gift. Not that these jewels would not be perfect for any woman. It’s just that they are so glamorous they deserve to be seen often! Party dressing calls for a statement in what concerns jewelry. Larger, shinier pieces are perfectly appropriate and contribute to the overall style and mood of the wearer. The main point here is to focus on one single piece that is special and will make a difference. When wearing a large piece of jewelry, one should avoid the Christmas tree look by limiting to one or two pieces at a time. – a special bracelet or cuff – the fashionable look. – an amazing pair of earrings – the classic look. 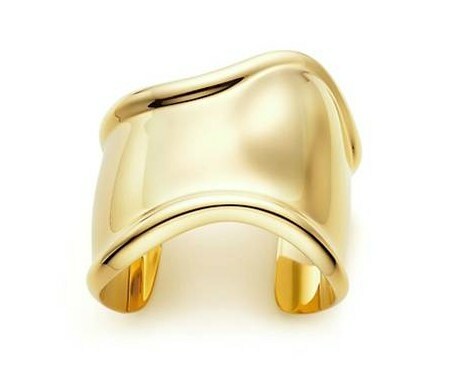 A cuff is a tricky piece to choose – easily too tough or too casual, it can make but also break a chic look. Fortunately, not all cuffs go the Goth way and I can point out a few that make the perfect evening look. My favorites come from Monica Vinader, who has been revisiting the cuff for a few years now and very recently launched a very handsome one as part of the Lace Collection (1). Delicate, punctuated by colored stones, it just cries “take me dancing, right now!”. 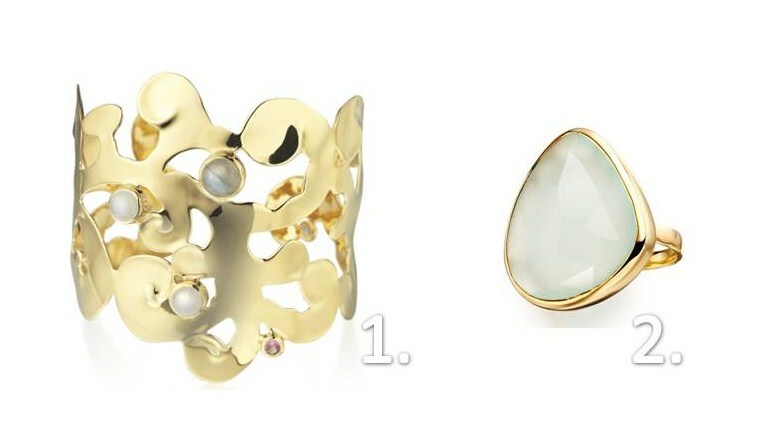 I would choose a large but simple ring to go with it, emphasizing the hand and wrist – why not the Siren cocktail ring (2) also by Monica Vinader? Coordinated but not matchy-matchy, they look perfect together but can be worn alone for a simpler event. 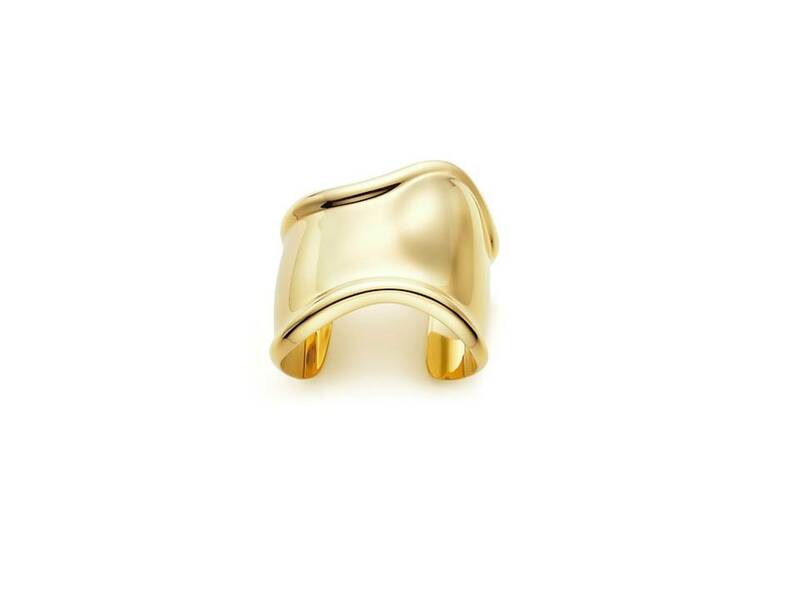 Another great cuff choice is Elsa Peretti‘s Bone cuff – choose the yellow gold one to be worn by itself. Pomellato has a broad range of jewelry collections but my absolute favorite – and party appropriate – is the Tango collection. The Tango key look is a diamond pavé on darkened white and pink gold. Diamonds are either brown or white, or even a combination of the two, according to the different designs. 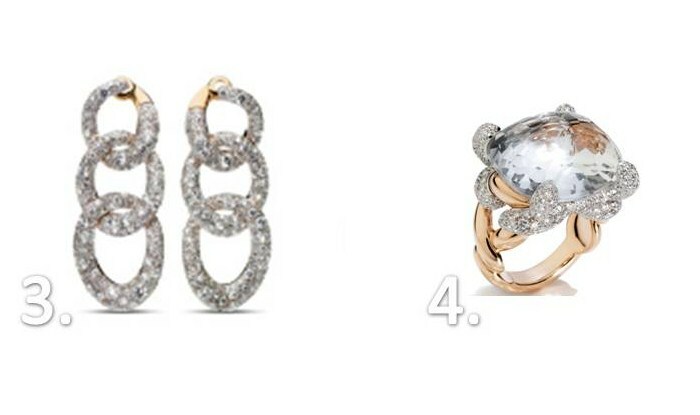 Numbers 3 and 4 show the best, absolutely foolproof, choices to achieve the classic winter party look: white diamond pavé link earrings and matching cocktail ring. Together with a little black dress – or, this season, a little burgundy dress – these jewels will make any woman the queen of the party. Pomellato also has an e-store, I just discovered! However, the Tango collection is not available directly. You would have to go to a Pomellato point of sale – browse their online boutique searcher to locate the one that is closest to you. This entry was posted in Bracelets, Christmas, Earrings, Jewelry, Personal style, Rings and tagged Christmas, Elsa Peretti, Jewellery, Jewelry, Monica Vinader, Pomellato, Silvia Taveira, Wishlist. Bookmark the permalink.